For athletes who prefer the classic look and feel of a bare steel barbell, the Rogue Castro Bar belongs in your arsenal. This polished 28.5MM bar is machined and individually assembled in Columbus, OH, and features the same quality U.S. steel, bronze bushings, and dual knurl marks as our flagship Ohio Bar. The texture of the signature knurling allows for a firm grip without feeling sharp, and the bare steel won't get slippery in sweaty hands--making the Castro Bar less dependent on chalk than many coated bars. With a minimum tensile strength of 190,000 PSI, the Castro Bar has the perfect balance of whip for the Olympic lifter and rigidity for the powerlifter. And its lifetime warranty against bending* ensures it can stand up to daily abuse—whether in a garage gym, college weight room, or professional training facility. A bare steel bar like this one does require a different level of upkeep than most oxide, zinc or chrome plated bars. Occasionally brushing the Castro Bar down with 3-in-1 or WD-40 will help prevent rusting and create a nice patina look. This is how bars were made for decades and it really produces an unmatched feel. 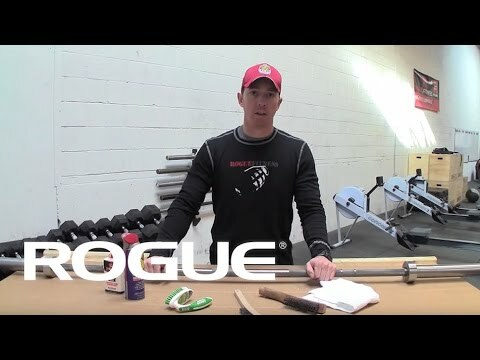 See More Men's 20KG Bars from Rogue. Please Note: A portion of the proceeds from the sale of the Castro bar will be given to the families of two fallen Navy SEALs. See their story here. Please Note: Like any fine piece of machined steel, a bare steel barbell will require some upkeep. Occasionally brushing the bar down with 3-in-1 oil or WD-40 will create a beautiful patina look. This is how bars were made for decades and it really does produce an unmatched feel. The Castro Bar is rated 4.9 out of 5 by 27. Rated 4 out of 5 by Isaac29 from Sweet Bar! I bought this barbell about a month ago to outfit a decent home gym. It is an excellent bar, I really love the knurling. My only issue with it was that it had some knicks and dings on it, especially on the end caps, and I had pretty high expectations on aesthetics with it being a Rogue bar. But it is perfectly functional and I’m loving training with it! Rated 5 out of 5 by Chris24 from Raw!!!!! Received this as a birthday gift from my wife and children.....one of the best birthdays ever......matches up nicely with my raw Ohio Power Bar & raw Ohio Deadlift Bar. Now if Rogue could offer the 28mm training bar in the RAW!!!! Rated 5 out of 5 by Famous from Excellent build quality - perfect knurling Really impressed with Castro bar - bare steel, knurling just right - not too aggressive yet clean and solid grip. Rated 5 out of 5 by Mike9 from My first bar 2 years ago. I bought this bar two years ago. It has held up really well besides a patina its like new. I love the bar steel and the knurling. Rated 5 out of 5 by Pizzadad from Great performance. I bought this bar used, 3 years ago with 260 lbs of bumpers. This Castro bar gets used heavily. I work out 3-4 times a week. My teenage son and his friends are in the home gym banging away 4-5 days a week And my wife gets out there at least 2 times a week(she has a bella bar but uses the Castro for dead lifts). Central Virginia humidity is rough on bare metal. I take this bar out side and scrub/oil it twice a year. It's got a nice dark brown look to it and a fantastic feel. I put it on the floor today and did a spin test. It is still straight. I could not ask for more.This is a great feeling barbell and has handled everything from crossfit workouts to basic power lifting. Rated 5 out of 5 by phillip5050 from Plain Solid I have had this bar for about a year. I work out in a detached garage in the humid south. I was worried about the bare steel, but I give it a little attention every other week or so. It has developed a nice patina. If you want a bare to shine like new forever, this might not be your bar. But, for awesome spin and unmatched feel in the hands this is it. I use it for everything and it holds up to whatever we throw at it. Rated 5 out of 5 by Al B from Awesome I bought 5 Castro bars and 5 Ohio bars for my gym. We've been using them every day for about 10 months and they are great, as advertised. If you follow a proper maintenance plan these bars will last forever. They will probably last forever either way, but take care of your stuff, you and your members deserve it. 100% satisfied.